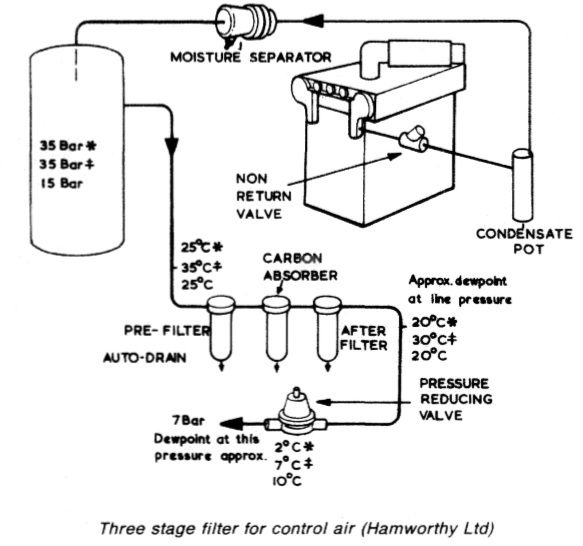 During operation, if the drop in pressure created at the suction side of a centrifugal pump (by liquid moving radially outwards from the eye of the impeller) is greater than the vapour pressure for the temperature of the liquid being pumped, then vapour will be drawn from the liquid in this area. The phenomenon is likely to occur if there is a restriction in the suction pipe, if the liquid is volatile or has a higher temperature than anticipated, or if the impeller speed is excessive. A vapour cavity of this type is likely to cause loss of suction or erratic operation. A lesser cavitation problem occurs when NPSH required by the pump is only just matched by the NPSH available from the system, because centrifugal pumps have features which promote localized cavitation. The impeller entry on the side away from the shaft has a profile which resembles that of a hydrofoil, and local liquid flow creates a drop in pressure which starts at the effective leading edge and extends along the surface. A vapour pocket created by a drop in pressure at this surface would collapse in an area of higher pressure and cause cavitation damage. A change of flow direction from axial to radial causes the fluid to experience different velocities and at the extremity, a drop in pressure could produce cavitation, again with subsequent bubble collapse and damage. The types of cavitation described could cause surface roughening and generate some tell-tale noise. Corrosion wastage could cause impeller wastage but the cast iron casing of a sea-water pump is a prime target. Because of their self-priming ability, positive displacement pumps are widely used for lubricating oil duties. This practice is completely satisfactory in installations where the pump speed is variable but when the pump is driven by a constant speed a.c. motor it is necessary to arrange a bypass which can be closed in to boost flow. By using a centrifugal pump with an extended spindle, such that its impeller can be located at the bottom of the oil tank, the H/Q characteristics of the centrifugal pump can be utilized without the priming disadvantages. 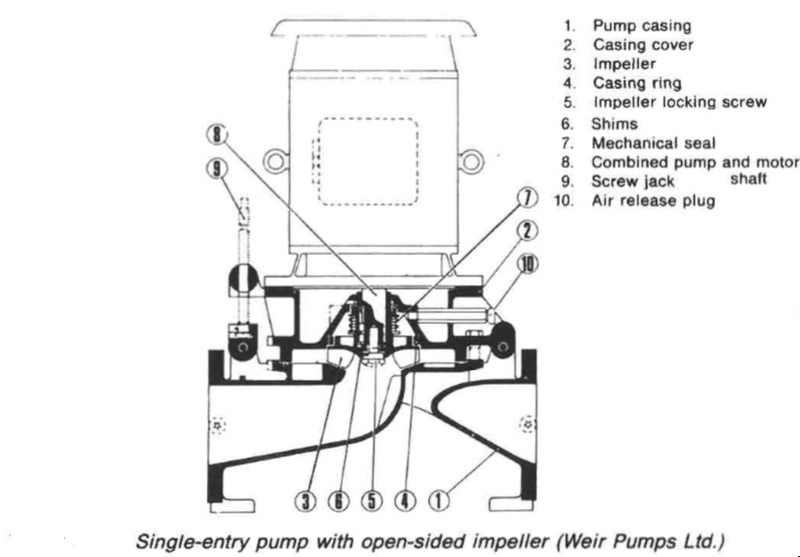 Known as the tank type pump this pump has a small open impeller. It can be driven directly by a high speed alternating current motor without capacity restrictions, whereas the permissible operating speed of the positive displacement type, pumping an incompressible fluid, decreases as the capacity increases. The pump will deliver an increased amount of oil as the system resistance is reduced, when the oil temperature rises and viscosity falls. In practice this is what the engine requires. A conventionally mounted self-priming pump is satisfactory for this duty if the suction pipe is short, direct and generously dimensioned. In a positive displacement pump the output varies little, if at all. 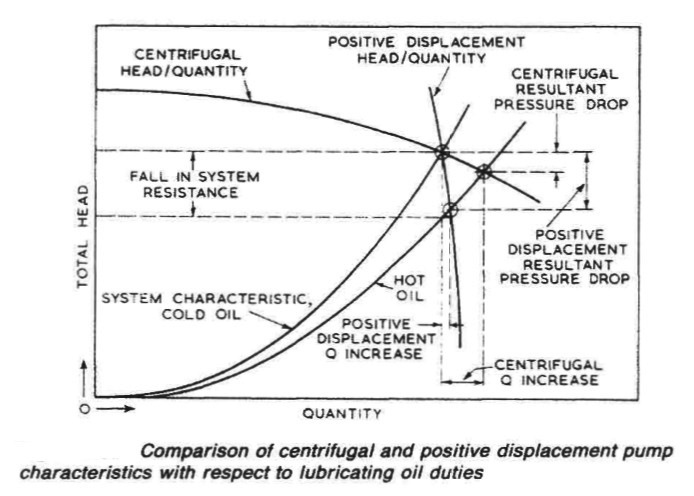 The latter point is readily appreciated on reference to Figure above in which, for simplicity, the effect of a change in the viscosity of the oil on the pump characteristics has been omitted, although this would favour the centrifugal pump and enhance the comparison still further.